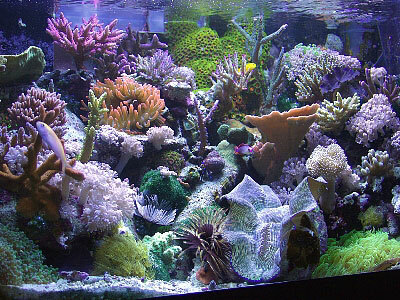 First and foremost, I would like to thank the folks over at Reef Central and Reefkeeping Magazine for selecting my tank to be the first Tank of the Month for 2004. What an honor it is! There are some truly amazing tanks out there that are obviously well taken care of by committed (and oftentimes obsessed!) 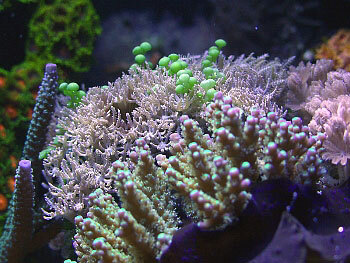 reef hobbyists. As I've frequently drooled over past tanks of the month, it's actually a dream come true that mine is also being recognized, especially due to it's small size, simplicity, and economy. I'm relatively new to reef keeping, however I have kept fish since childhood. 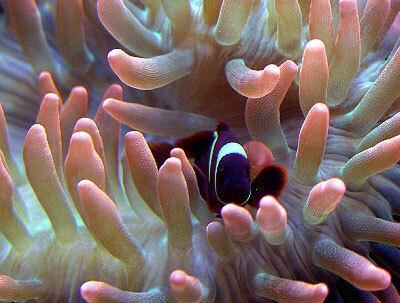 The reef tank you see today is only an evolutionary snapshot of an on-going fascination with all things wet. My first experience in marine husbandry occurred while growing up in southwest Florida where I had easy access to the inter-coastal waterways surrounding the Ft. Myers area. The variety of wildlife that I encountered amongst the waterways, beaches, mangroves, and islands definitely held my fascination. My brother and I, who is presently working off Sanibel as a charter-fishing captain, would frequently catch shiners and crabs and bring them home to keep in jars and bowls. 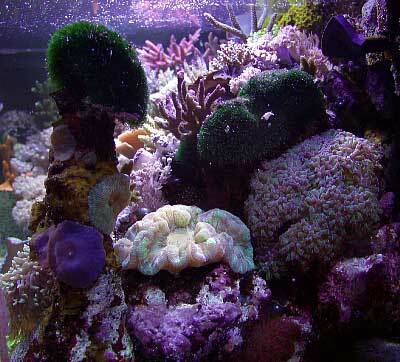 Eventually, by high school I was keeping a 20-gallon marine aquarium using a gravel bed with undergravel filtration. 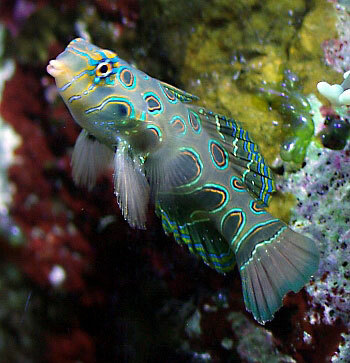 I had a dwarf lion, flame angel, mandarinfish, Chromis, and other sorts of fish not appropriate for that size tank or combination. The tank was broken down for my move off to college but I resumed keeping fish, this time African Cichlids from Lake Tanganyika. At this point, I was determined to create the best possible environment for these guys, so I researched and created as accurate as possible a simulation of the rock environment they are found in. It was a great tank, but the saltwater bug still infected me and upon visiting a particular fish store in Columbia, South Carolina, while looking for a particularly rare cichlid, I was bitten 'big time' by the reef bug. Their displays were incredible and after inquiring about how to actually keep a mini-reef and seeing the systems in operation behind the scenes, I returned home and changed my 40 gallon cichlid display over to a full, blown reef environment. 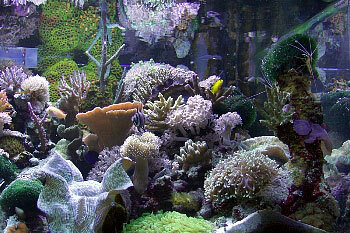 Live rock and sand was added to the tank late in March of 2002. 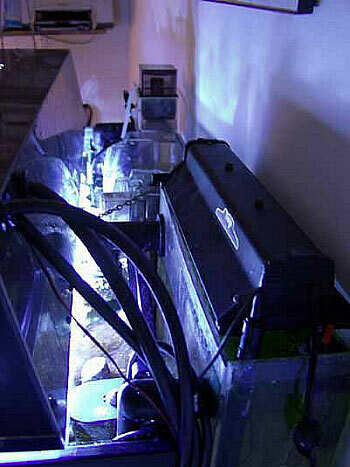 The hobby of marine aquarium keeping sure has changed within the past ten years! much like an entertainment unit for a TV. 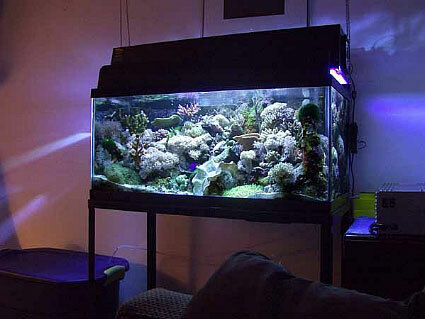 The scale of this type of furniture would be too large for the room the tank would occupy. It was important for me that one would see the tank and not a huge piece of furniture or lots of equipment lying about. 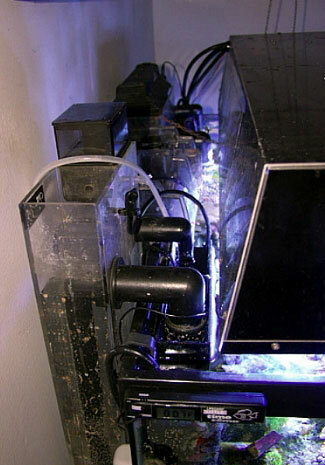 So, I decided to go without a sump and, instead, relied on a hang-on-the-back type skimmer and refugium system. The tank sits on a black, wrought iron stand, the lighting is suspended above, and the ballast rests on a black file cabinet that is, for the most part, hidden by the arm of the sofa. When walking into the room, all that one really notices is the tank. Overall, the system is based on simplicity and economy. Because of this, I've discovered several pros and cons of such a design along the way. Over the last year, I have learned to let the tank work for me rather than the other way around. In any event, the final consideration dictating the design of my system was to establish a routine so I could enjoy, rather than constantly work on, my tank and this came with more experience rather than planning. Dimensions: 36" x 18" x 16"
Free-standing iron tank stand, 36" x 18"
approximately 50 lbs. of pink Fiji sand, which in turn creates a 2" deep bed on average. Due to the powerheads and my 7" T. derasa, the sand gets blown around quite a bit and in some places there is a 4" sand drift, while in others (especially under the T. derasa) there is practically no sand. 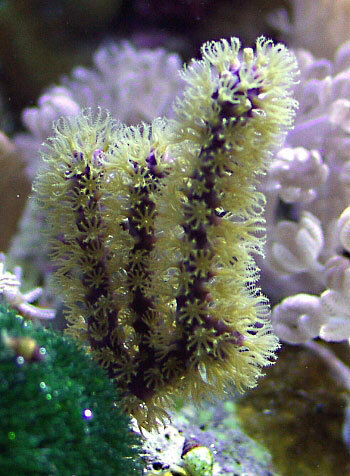 In addition to the rock and sand, a small CPR hang-on-the-back refugium is used to grow macroalgae to help with nutrient export. There is also about a 4" sand bed in the refugium. The CPR Bakpak 2 protein skimmer does a good job of removing wastes, and the collection cup needs emptying about once every five days. Since the tank's initial cycle, I have had zero ammonia, nitrite, and nitrate readings using Salifert test kits. a sump and a closed-loop system would really clean out the mechanical components in the tank. 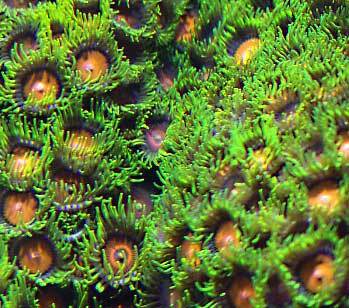 However, as the tank matures, coralline algae, polyps, zoanthids, and other organisms are nicely encrusting the components. just too much contrast. The light spread provided by the dual metal halides is much more even and soothing to the eyes. One would think the additional bulb would make the tank visually too bright, but in reality it reduced the amount of contrast throughout the tank. 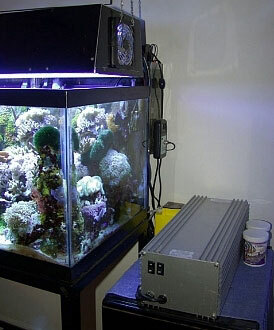 Like most reefkeepers, I am constantly tweaking my system and I eventually changed out the 10K bulbs for 20K's, just to see what would happen. It took about 10 days for the bulbs to truly burn in, and during that time the tank honestly looked a little too blue. 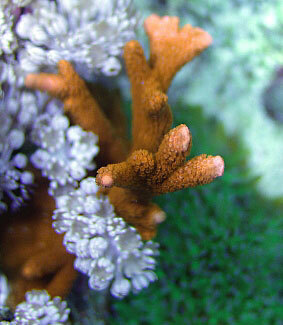 But after the burn in, and as my eyes adjusted, I started noticing pronounced positive affects on all the corals. 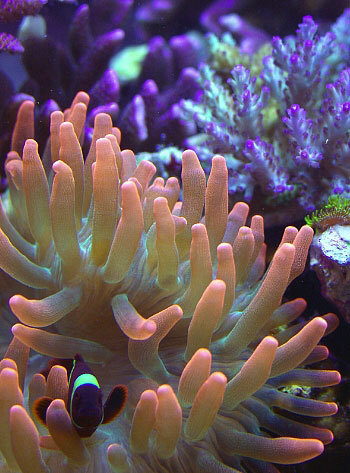 The growth rates of my corals never did slow, in contrast to what some aquarists have observed under higher Kelvin bulbs, but boy, did the colors ever become more saturated! The XM bulbs have been running now for three months and I am very happy with the results so far. I stagger my lighting schedule and I especially like how the left and right halides come on and off at different times, much like the rising and setting of the sun. 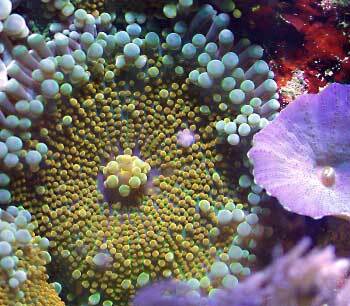 As more and more calcium demanding corals were placed in the tank, I experimented with a variety of dosing methods. At first, I found B-Ionic to work the best for me, but the daily chore of dosing, not to mention teaching my house sitters how to dose while I went on vacation, became a chore and a concern. As I mentioned earlier, I'm frequently plagued with a case of "the lazys," so I needed to come up with a more efficient method of dosing. I have found that dosing Kalkwasser using a Vario peristaltic pump works great. I make up a three weeks' supply using 25 gallons of RO/DI water plus 250ml of vinegar and 14 tablespoons of kalk powder. The 25 gallon tub sits on the floor adjacent to the tank (a downside to not having a finished tank stand) and the solution drips at night, replenishing all evaporated water, and boosting the calcium and alkalinity levels. When I first experimented with dosing kalkwasser, my pH was all over the map. With the help of Randy Holmes-Farley, I found that a little vinegar keeps the pH in check. I have been using this method for over a year and my pH, calcium, and alkalinity ranges are constant. I have tons of Xenia. Tons! For better or for worse, I finally gave up and let it go wherever it wants, whenever it wants. 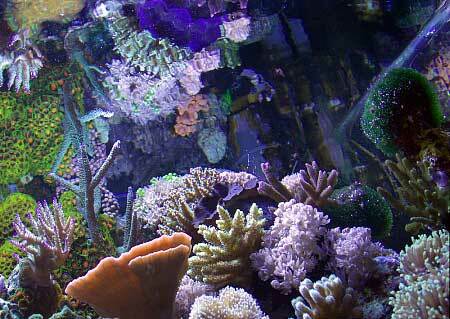 The upside to this is that it fills in between the hard corals, making for a very nice display. The downside is that it needs pruning every other month and it's my belief that it also depletes iodine rather rapidly. I also noticed the mushrooms began to lose color and not open up, and I attribute this to the iodine depletion. So, in addition to a nightly dosing of kalkwasser, I dose 5ml of Kent iodine each Saturday. The mushrooms responded to this additive perfectly. To my surprise, the tank needs very little in the way of maintenance other than the supplementation with the additives mentioned above. My biggest obstacle to overcome was simply establishing a consistent work routine to keep the water parameters constant. This took well over a year for me to learn. However, from day to day, I just clean the algae film off the inside glass and fingerprints off the front. 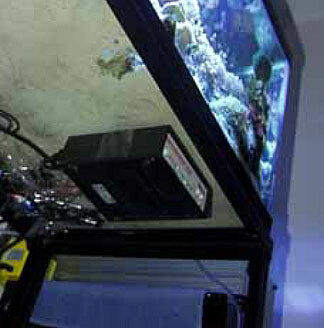 I also clean salt creep off the equipment and the top edge of the tank as needed. 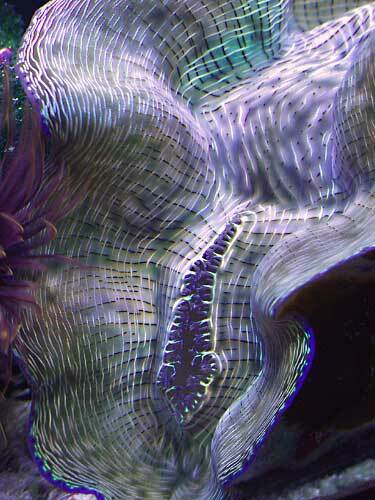 The skimmer cup is emptied about once every five days or so, cleaning it under hot water with a toothbrush. 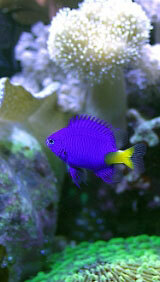 Every two to three weeks, I do a 5 gallon water change using RO/DI water and Instant Ocean salt mix. 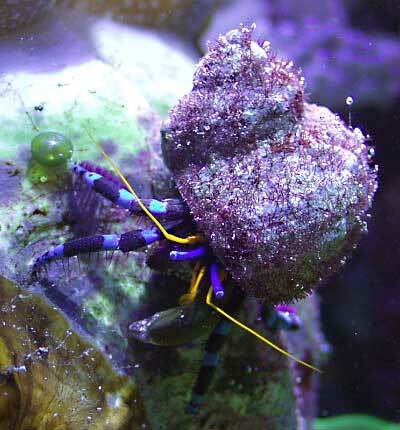 I only once had a hair algae problem and that was during the tank's initial cycle before the hermit crabs were added. I occasionally have problems with brown wafer algae and Valonia, but in my mind, as long as these algae types don't get out of control, they make for a more natural appearance in the tank. a combination of Sweetwater Zooplankton, chopped squid, Mysis shrimp, nori, and flake food with a little bit of Selcon added, but I generally rely on the ready-made food items due to convenience. 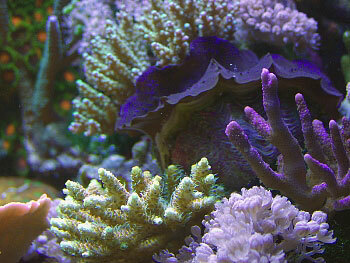 My tank is predominantly a hard coral, mixed reef. 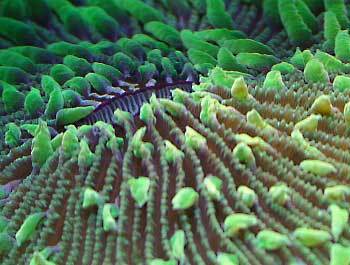 Most of the corals below are small in size, the largest being the green Favia on the bottom of the tank. 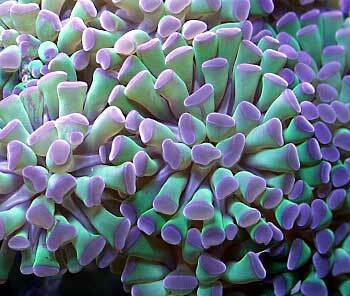 All of the Acropora were purchased as fragments from fellow reefers, such as Patrick Monaghan and David Playfair. 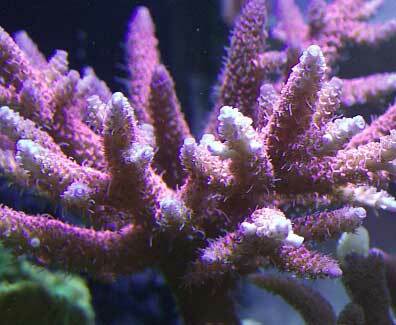 Most of the other corals of the branching type also were aquacultured as fragments while all of the soft corals are fragments that I either purchased or traded for. 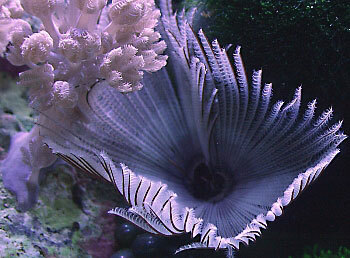 I cannot confirm the history of the Favia, Turbinaria, Trachyphyllia, or the Tubastraea, but I suspect that they were collected from the wild. 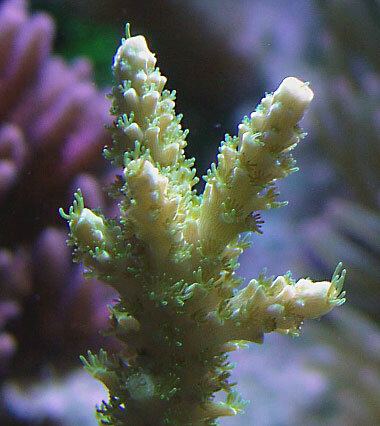 Because of the density, I am constantly trimming and cutting back corals, and I have recently reached a point where I frequently trade and sell fragments to local reefkeepers. There are many territorial battles taking place and it's interesting to see how some corals establish a neutral zone while other corals aggressively attack one another. 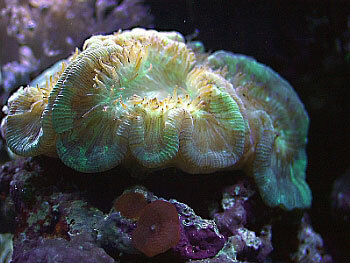 Favia (moonstone, red with green centers) sp. 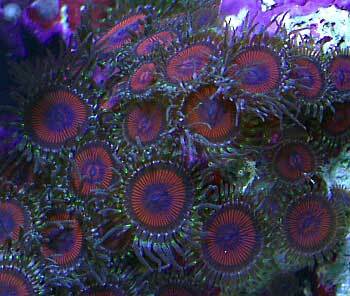 Zoanthids (red, orange, green, yellow) Zoanthus sp. Many reef keepers may feel that I have a high bio-load and the seven fish that I currently have do contribute immensely to this. However, my ammonia and nitrate readings steadily remain at zero. I selected these particular fish based on their different color, shape, and patterns. 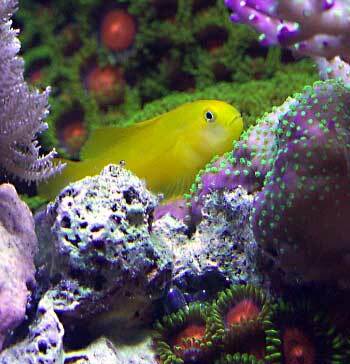 Since they all occupy very different niches on the reef, they do not compete for food or territory in my tank. 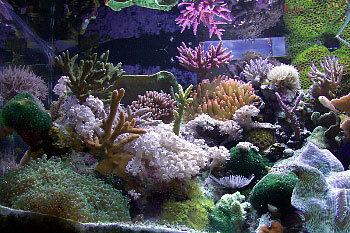 Because of the rate of growth and number of animals in my tank, I have planned to upgrade the tank and all systems in the Summer of 2004. 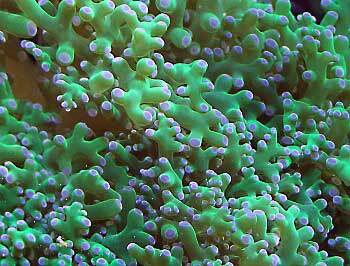 I'm not necessarily interested in adding more corals, I simply would like to see what I presently have grow larger. Upgrading the system, which includes turning this 40-gallon tank into a sump, will definitely take a little stress off the inhabitants. Thanks for taking the time to read about my tank. Please feel free to visit my website and email with questions, thoughts, or suggestions. To learn more about Brad's system, visit his website by clicking here.